As in other parts of Quebec, German-speaking immigrants, including some Loyalists with German roots, integrated well into life in the Eastern Townships and surrounding regions. This compilation describes the towns and villages where some of these people have lived from the late 1700s to the 20th century. It names the churches they attended and the cemeteries where they were buried, and it helps the researcher locate these records. Here’s a guide to the Irish Catholic Churches of Quebec. Use this guide to find out where the documents you want to find are located. 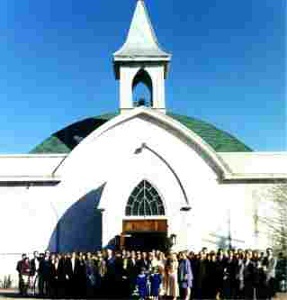 You can also find photos of the church parishes your ancestors attended. This compilation was edited on Nov. 21, 2018. A new version will be coming in 2019. In the late 1940s and early 1950s, 1,000 babies were sold to adoptive parents through a black market baby ring that operated in Quebec. Most of the babies were born to unwed French Canadian mothers, most of the adoptive families were Jewish. Some of the children went to homes in Quebec and Ontario, and many grew up in the United States. In 1984, my husband found out he had been adopted and that his parents had paid about $2,000 for him. About 15 years later, he found out about the black market baby ring that had arranged his adoption. Ever since then, he has been sharing his story with friends, with community groups and through the media. Several years ago, Global television told the story of Harold’s search for his birth mother on the program Past Lives. This week, the Montreal CTV station aired a news feature about the black market baby ring. It puts Harold’s story in context, explaining how most of the mothers who gave birth out of wedlock had no choice but to give up their babies. Harold counts himself lucky that he ended up in a good home and not in an orphanage. The ring was broken up 60 years ago this year. Some of the birth mothers have no doubt died, and many of their children are probably still trying to find them. The story is still fascinating. Karen Balcom of McMaster University has written a book that addresses this topic: The Traffic in Babies: Cross-Border Adoption and Baby-Selling between the United States and Canada, 1930-1972 Studies in Gender and History, University of Toronto Press, 2011. You can learn more about Montreal’s black market baby ring on the Parent Finders Montreal website, http://www.pfmtl.org/BMB/index.html. At the bottom of the page, there is a list of dates, pages and titles of old newspaper articles about the case. Paste in the url for one of these stories from The Gazette, http://news.google.com/newspapers?nid=Fr8DH2VBP9sC&dat=19540215&printsec=frontpage&hl=en, and from there you can easily browse the newspaper to find the other articles. There is a Montreal Black Market Baby Facebook page. Feb. 23 2016, this post has been updated. The link to the CTV feature now works.